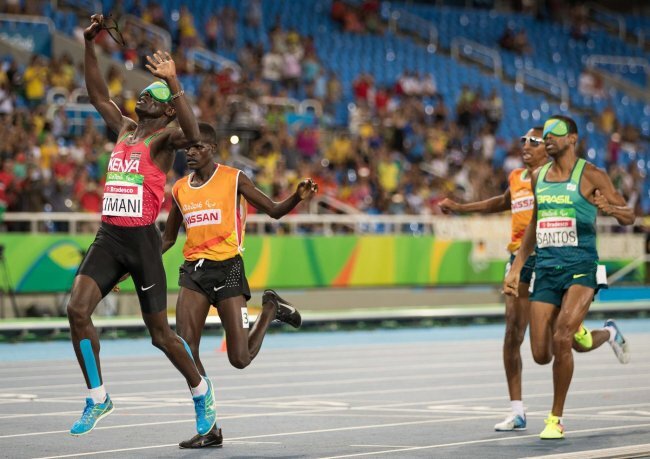 Kenya’s visually-impaired Para athlete Samwel Muchai completed the distance double on Tuesday (13 September), adding 1,500m gold to the 5,000m titles he had already won at Rio 2016. Muchai defended his 2012 London Paralympics Gold Medal in 4:03.25 with home favorite Odair Santos winning silver in 4:03.85 and bronze for Turkey's Deniz (4:05.42). He is the only Kenyan of the team of nine in Rio to have won gold at the Paralympic games. Tuesday's was his third Paralmpic gold medal and fifth medal at the games. He has matched the successes of Abraham Tarbei, Henry Kirwa and Henry Wanyoike who were Kenya's most successful Paralympians in individual events having won three gold medals and one bronze medal each. Muchai now has three gold medals and one silver from Beijing. Expectations in Rio were high for local star and multiple world champion Odair Santos in the men’s 1,500m T11. But it was 26-year-old Kenyan who proved to have the superior sprint finish, striding past the Brazilian in the final 50m to take his second gold of Rio 2016. “I feel so good for this, for winning the race,” said Muchai, who crossed the line in 4:03.25. Sprinter Nancy Chelangat was relegated to fourth in her T11 200m qualifying heat and therefore missed out on the final. But she managed to run her personal best of 29.88 behind the winner Chinese Cuiging Liu who qualified first in 25.17 seconds. Meanwhile, Nigeria is the top ranked African nation at the games with seven gold medals. Nigeria lies ninth in the medla standings topped by China with 63 gold medals. Nigeria earmed its seventh gold in style through Flora Ugwunwa who led a 1-2-3 Africa sweep for medals in the women’s F54 Javelin throw. The 32-year old erased Tunisian Hania Aidi’s World Record (WR) of 18.86m as she extended the mark by almost 2m. Her third attempt was measured at 20.25m. The world record holder Aidi also threw a personal best of 18.88m for Silver, while South Africa’s Ntombizanele Situ won Bronze after a throw of 17.90m, also a personal best. Nigeria has dominated the Powerlifting competition in Rio, winning six gold medals.